If you have ever planted some seeds, you may have noticed that some seeds do not germinate. A good quality seed is the first step toward producing a good crop. If the seed does not germinate, the cost of seed and all related plantation and irrigation costs will be a loss for the farmer. Scientists and farmers continuously try to identify any possible factor that may affect seed germination in order to have a higher rate of germination. The rate of germination is one of the key elements in determining the quality and value of any seed. 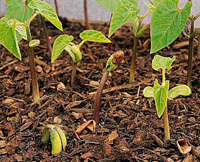 Select an environmental factor and study the effect of that factor on seed germination. Environmental factors can be light, UV radiation, temperature, pH, etc. Design and perform experiments to study the effects of one factor on seed germination with the scientific method.